The Venus 580/6 caravan, the Xplore 526 caravan and the Sprite Major 6TD caravans are all six-berth touring caravans built on a single axle Al-KO chassis. Six berth caravans aren’t exactly run-of-the- mill so we selected three models for comparison and we particularly looked at the safety and security aspect along with value for money. All three caravans have a lack of standard security and stability devices. The Sprite Major gets extra points for its standard fit Tracker Retrieve tracking device which will give owners peace of mind and a healthy insurance discount. We’d recommend investing in the stabiliser. Also buyers of the Elddis and Lunar would be advised to invest in the AL-KO Secure axle wheel lock to give extra protection from theft and lower their insurance costs. The Elddis wins out if you’re looking for a light tourer. This could be significant if you don’t own a towcar with a hefty kerbweight! The Lunar Venus’ payload is the biggest here – allowing you to take more with you on your travels. 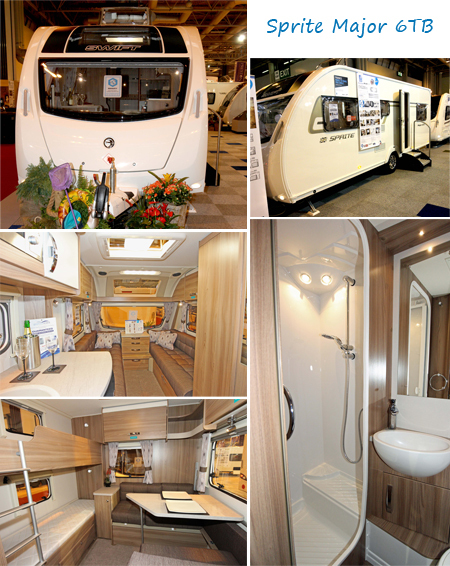 These caravans are relatively low spec but there are plenty of options to add a touch of luxury. There are many fans of the Sprite’s panoramic sunroof. An iPod connection will be a must for some who like to play a few tunes whilst on tour – it seems you would have to invest in options pack to get this feature. AL-KO’s ATC available on the Swift and Elddis as an option is a fantastic safety device than can aid stability whilst towing and several caravan insurance specialists offer discounts for its fitment. One thing to bear in mind is that many of the items in these optional packs such as alloy wheels will enhance resale value when it’s time to trade. 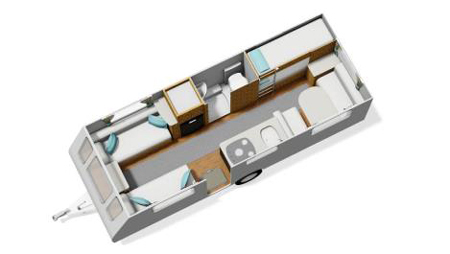 All of the caravans are designed with two fixed bunks at the rear of the caravan; the Swift and Xplore have kitchens and shower rooms mid-ships while the Venus has an offside rear corner shower room. In the Swift and the Xplore there are two bunks at the rear, which convert to a living/dining area, or just a dedicated den for the children, perhaps. In the Venus, meanwhile, turning the side dinette into a sleeping area creates space for two more people at night. All three models had traditional parallel seating at the front, with a chest of drawers, thus becoming two singles or one double bed. In terms of specification, the Xplore has the shortest shipping length, at 7.11m and the shortest internal length at 5.25m. External widths vary marginally, but they may be enough to sway your decision, especially when considering storage of a caravan; Xplore measures 2.18m, Venus is 2.20m, and Swift is 2.23m. Best for security: The Sprite wins here due to it’s standard fit Tracker Retrieve. We would still advise investing in the optional security offered with all three models. Best for weight: As far as modern caravans go, all three are comparatively light. With an MTPLM of just 1317kgs, the Elddis Xplore comes out on top as the lightest model on the list, but the Lunar Venus gives you a higher payload to play with. Best for appearance and interior design: We thought in general, the Sprite had the most upmarket feel inside. We really like the distinctive blackened front end look of the Sprite when the panoramic sunroof is specified and the grey locker panel on the front of the Lunar. We much prefer the glass style shower doors in the Sprite and Venus rather than the curtain found in the Elddis. Tell us which model you prefer and why using the comment box below. 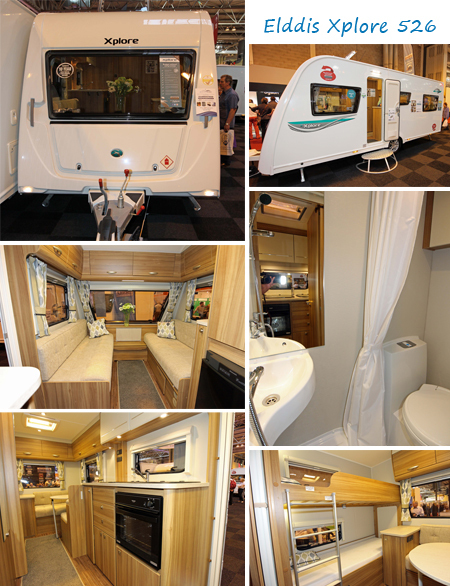 *Lunar caravan insurance cost based on Lunar Venus 580/6 caravan retailing at £14,999 fitted with hitch lock. Kept on drive at HX4 0BE. Caravanners over 30 years old, claim free for 3 years and a member of a caravanning club. £100 excess. 180 days European cover and up to £75 per day for up to 15 days emergency accommodation cover included. Legal expenses cover, extended European cover and other emergency accommodation expenses cover options are available at extra cost. Quote includes 10% online discount and 6% Insurance Premium Tax and is correct as of 23/04/15. 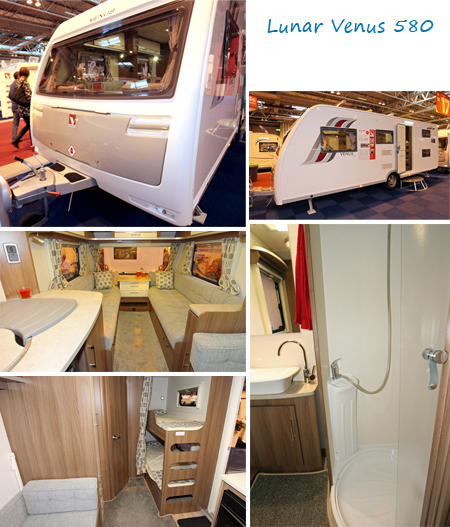 **Elddis caravan insurance cost based on Elddis Explore 526 retailing at £14,999 fitted with hitch lock. Kept on drive at HX4 0BE. Caravanners over 30 years old, claim free for 3 years and a member of a caravanning club. £100 excess. 180 days European cover and up to £75 per day for up to 15 days emergency accommodation cover included. Legal expenses cover, extended European cover and other emergency accommodation expenses cover options are available at extra cost. Quote includes 10% online discount and 6% Insurance Premium Tax and is correct as of 23/04/15. ***Swift caravan insurance cost based on 2015 Swift Sprite Major 4 FB retailing at £15,220 fitted with hitch lock, Tracker Retrieve and optional AL-KO Secure wheel lock. Kept on drive at HX4 0BE. Caravanners over 30 years old, claim free for 3 years and a member of a caravanning club. £100 excess. 180 days European cover and up to £75 per day for up to 15 days emergency accommodation cover included. Legal expenses cover, extended European cover and other emergency accommodation expenses cover options are available at extra cost. Quote includes 10% online discount and 6% Insurance Premium Tax and is correct as of 23/04/15. I own a 2014 major 6td. We loved the look of it straight away but one of our most useful area is the back where all 3 of us can sit at the table.